Down where I live, this is the one of the only kinds of snowmen my kids know. He’s glittery and on paper here, but we also have ’em to set out on the mantel, hang on the tree, and on stockings, too. They’re hoping, hoping, hoping that they’ll see snow on Friday. As I type this at 1 am, our forecast says, “Snow showers. Cold. Temps nearly steady in the mid 30s. Winds NNE at 10 to 20 mph. Chance of snow 70%. Snow accumulations less than one inch.” When the kids were talking about the possibility of white stuff, there were a couple of words they mentioned that made me cringe a little inside. Early and release – two words that I usually don’t mind together but with all the stuff I need to do before our family Christmas gathering on Sunday. . . . those two words kinda frightened me. So much for trying to get the house spotless and all the decorations out (as if that would really happen during the day. . .who am I kidding?)! Anyway, we shall see what Texas weather brings. I am sure that in a couple days we’ll be in the mid-70s again, and the blustery weather we’re expecting will be history. . . The card is based on one I fell in love with in Edna15‘s gallery. You can find the sketch on Beate’s blog here. Make sure to check out what Beate, Charmaine, Laurie, Lori, Mary Jo, and Sharon have done. . . I have two weeks to catch up on and can’t wait to see what pretty stuff they’ve shared! Paper: Brushed silver from my local Fas Clampitt, aqua is Core’dinations. Stuff: Double Scallop punch at top by Martha Stewart, Cuttlebug Swiss Dots folder, Making Memories felt snowflakes, random pink snowflake brads, pink Swarovski crystals (where’d all my clear ones go?? ), aqua button, May Arts ribbon, dazzling diamonds and diamond dust glitter, and foam dimensionals. Ink: StazOn opaque cotton white + Palette Noir. Stamps are from Papertrey, designed by sweet Pinefeather, Heather Nichols. Love that set! I can’t believe that I’ve lived in TX for just over a year, and I’ve seen a big hurricane, snow flurries last fall and more snow this fall! Crazy! Have a great weekend! There is so much to love about this card! I always love the bling, but how you put it all together is awesome! The dazzling diamonds & dust really make this card shine. Heck w/the clear rhinestones, I love the pink! This card is darling!! 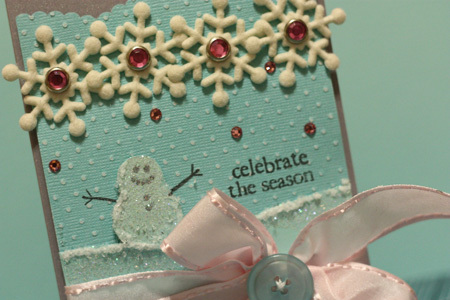 The dotted swiss embossing reminds me of background snow falling. I love your card! YEP….I live in Baton Rouge, Louisiana and have the same forecast. BUT our weatherman said IF WE WANTED TO SEE THE REAL THING then we have to be outside between midnight and 5am! Can you image all the people that will be waiting and outside? I will be one of them. This is soooo CUTE Jenn! Well I live in Brisbane Australia and it was 100 in the shade today, with bright blue skies and a hot breeze!! 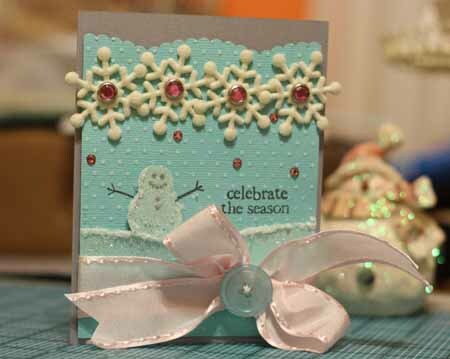 Great card Jenn, I am totally rapt with the sketch challenge, and your card is gorgeous, lovin’ all the sparkle too!! this is STINKIN’ CUTE and I’d not seen these felt snowflakes … must go shopping … TFS! Your card is beautiful! I love snowmen! Sooooo, did you get snow? This is so sweet! I love those snowflakes! wow! this is gorgeous! love the soft touch of pink with that ribbon.